Break red chilies into small pieces. Dry the dry coconuts under sun for 30 to 45 minutes or roast them in a microwave oven. Place the dry coconuts in a microwave oven and roast on high power for 20 seconds. Cut the coconut into small pieces. Take a dry mixie jar and add some coconut pieces and grind to get grated coconut. Similarly grind the remaining coconut pieces and make grated coconut. Take this grated coconut into a deep bowl. Now grind the roasted bengal gram in the mixer grinder and make powder. Add the roasted bengal gram powder to the grated dry coconut and keep it aside. Heat a pan and add ghee. Melt the ghee and add bengal gram and fry stirring on low flame. After few seconds, add black gram and red chili pieces and fry stirring. When the red chilies are crisp separate them with a ladle and transfer them to the mixie jar. Then add cumin seeds to the seasoning and fry stirring till the seeds change color to golden. Then transfer the seasoning into the mixie jar. To the remaining ghee add curry leaves and fry till they are crisp. Once crisp, transfer the curry leaves to the mixie jar. Now grind this seasoning and mix with the roasted bengal gram powder and grated dry coconut. Add salt to taste and mix all well. Take a mixie jar and add some prepared and mixed powder to it. Blend using the pulse button. 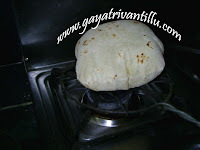 Do not grind the mixture for long time as the dry coconut releases oil and the mixture becomes lumpy. Add some powder to the pan and clear all the ghee. Add asafoetida and mix. Blend the mixture in batches and mix well. It is better to use fingers to mix the mixture well. Transfer the prepared KOBBARI PODI to a dry container and store. This powder tastes good with plain rice and ghee, dosas, idlis, utappam, pesarattu etc.. If desired increase dry coconut portion and reduce the roasted bengal gram portion. However the more dry coconut the more lumpy the mixture will be. So it is advisable to use the given measurements only. Use red chilies according to taste. With the red chilies shown in the movie clip, the powder tastes good—KAMMAGA UNTUNDI. Drying the coconut under sun also depends upon the severity. In summer one may keep the dry coconut under sun for just 15 minutes, in winter may be for one hour. Bottom line is one should not see traces of oil on the dry coconut after drying. Similar is the case with roasting in microwave oven. As timings differ from one microwave oven to the other, it is advisable to roast by watching. While grinding also run the mixer grinder for some time and then mix with a spoon. Then once again grind till the coconut is grated. Do not run the mixer grinder for long stretches while grinding coconut as oil is released from the dry coconut. Do not fry the red chilies till they turn dark. Transfer the fried crisp chilies to another bowl or plate or into a mixie jar immediately once they are crisp—otherwise the powder gets burnt smell. It is very important to blend the powder in batches and using the pulse button—mixing with a spoon. Dry coconut when ground for long stretches releases oil and makes the powder lumpy. Such powder on long run tastes oily too. 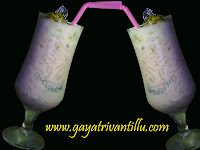 So use the given measurements to enjoy the taste of dry coconut without tasting oily.